It has been said that my collections have collections. Through the years I have collected everything from Matchbox Cars to books from the late 19th to early 20th centuries. Among all of the collections and interests through the years one of the earliest collections was baseball cards. Back when packs of baseball cards could still be purchased for pocket change and included a stick of card staining bubble gum, I collected cards with the best of them. I even had a small business selling cards to my friends and neighbors and would buy boxes of cards at the Sam’s Club. I would also ride my Diamondback bike to the neighborhood 7-11 and get a few packs of cards, some comic books and some powdered doughnuts. Of course I would not look at the cards and comic books while eating the powdered doughnuts since no one wants to get powdered sugar on their cards and comic books. From 1983 to the mid nineties I collected cards with a vengeance. My collection was not limited to baseball cards. Football, hockey and NASCAR cards were also collected. I even have some cards from various televisions shows and movies. This album was started 30 years ago. This is the year it is finally completed. Put quite frankly my collection of cards had a collection of cards. Many of the sets were put together pack by pack which meant many doubles, triples, and even fourths of cards was inevitable. In some cases the extra cards could be traded for missing cards needed to complete the collection. In most cases though the extras went into boxes in a closet to be forgotten about. Other sets joined the collection as part of factory sealed sets which allowed me to finish the set with a single purchase. Factory sets also ensured that the dreaded gum stained cards would not be an issue. The other day it was announced that Ryne Sandberg had been named manager of the Philadelphia Phillies and that had me thinking about baseball cards again. So what does Ryne Sandberg’s promotion have to do with baseball cards you are probably asking yourself? It has to do with baseball cards in that the promotion of Ryne Sandberg got me thinking about my 1983 Topps baseball set which included Ryne Sandberg’s rookie card. It also included the rookie cards of Hall of Famers Wade Boggs and Tony Gwynn. Recently named Phillies manager Ryne Sandberg was a rookie with the Cubs in 1983. 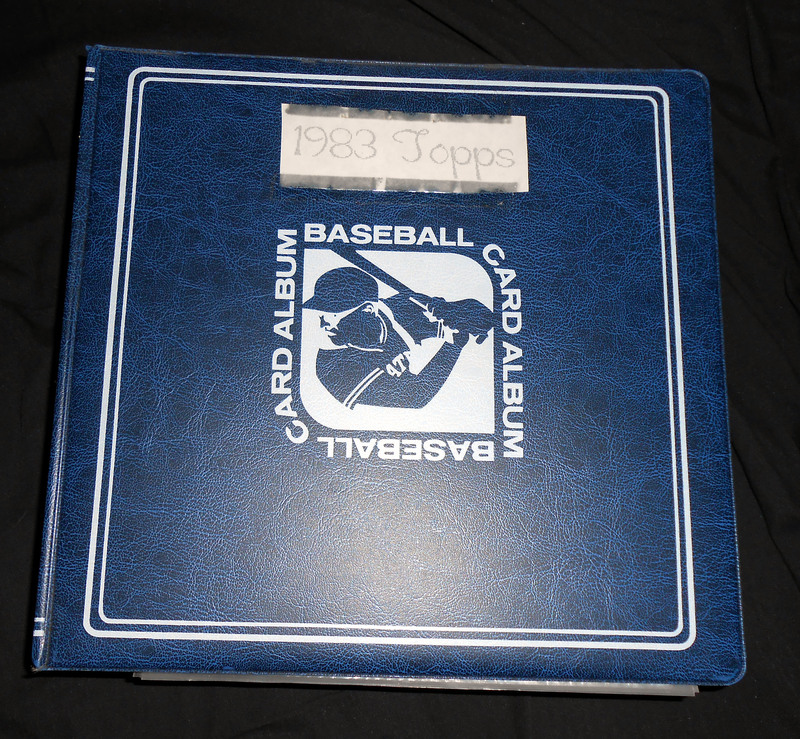 As I was thumbing through my 1983 set I was reminded that while it was the first year that I started collecting baseball cards it also represented my only unfinished set in my collection. So, 30 years after I first started the set I decided while sitting on my living room floor that I would finished the set before Christmas this year. Of course it would have been much easier to have had this grand vision back in January to have eight more months in which to work on the goal but I have always worked better under the pressure of deadlines. So, over the next four months I will complete the set. Of course, finding assorted 30-year old baseball cards will not be easy. While there are a few shops that may still have a dusty binder full of cards it is more likely that I will end up using the internet to find the missing pieces. Back when I was collecting my sets before, I carried around checklists in my wallet for each set I was working on. The checklist was numbered from 1 to 792 or how ever many cards that particular set had and has I found a card I would cross it off of the list. The checklists came in quite handy whenever I was trading cards with friends or looking through boxes of cards at a baseball card shop. With a single glance I could tell which cards I had and which ones I needed. 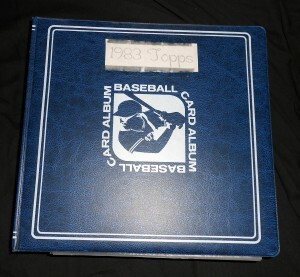 After creating a new list it was determined that I am 125 cards short of completing the 1983 Topps set. 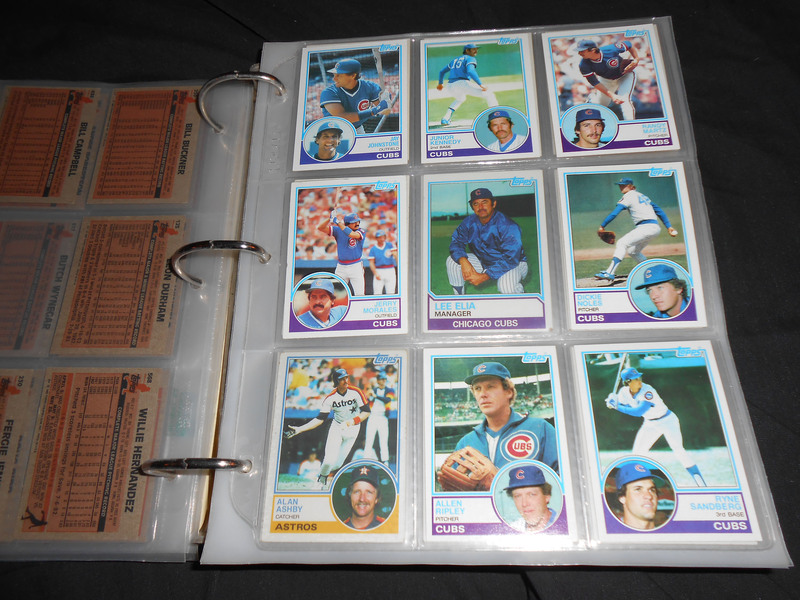 Sadly, I could not locate my 1983 checklist so the first step in resuming the quest to finish the set was to determine how many cards I still needed by creating a new checklist. 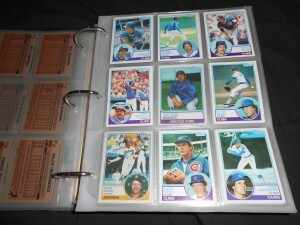 One by one I went through my binder with the 1983 set in it and crossed of the corresponding number on the checklist. I was encouraged as each number was crossed off since it meant that it was one less card that I needed to find. After a very detailed review it was determined that I still need 125 of the 792 cards in the set to complete my 30-year quest. 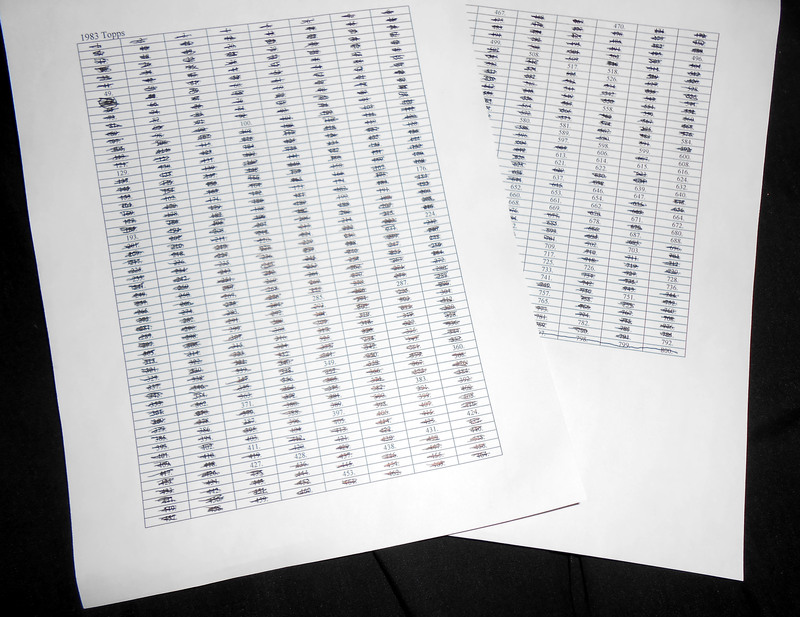 While the number is larger than I had hoped, it is certainly doable to complete. Of course a quick search online showed that I could order the complete 1983 set for around $50 if push comes to shove. I think I will try the old fashioned one card at a time route just like 30-years ago me would have done. Of course this time I will have Ebay at my disposal so I will only have to worry about getting the powdered doughnut stains on the keyboard instead of the cards. Now if you’ll excuse me I need to try to figure out where to find some 30 year-old baseball cards.